Students are taught about numbers, sums and counting in school, but unless your child takes up Business Studies at second level, there is no class to teach them about managing their money. 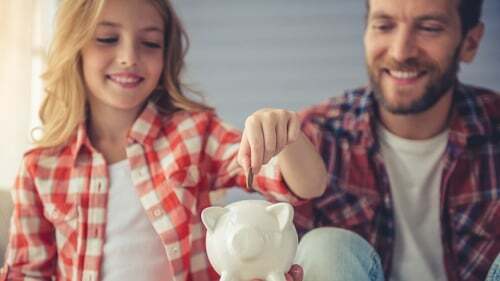 Finances may not be something in which many kids have an interest, but it’s vital that they begin to understand from a young age what it means to earn, spend and save, and the consequences of each. Whether it’s something as big as First Communion money, or as little as the weekly fiver in the hand from the grandparents, your children should get into the habit of saving a portion of their money. Remember, at this age, it’s not about the amount – it’s about the principle. Help them to make saving fun by giving them a goal to work towards, such as a toy they really want, or a trip they’d love to take or even buying a birthday present for their Mum or Dad. If they need help – or if their piggy bank is easy to open! – consider offering to keep their money safe for them, and set up a star chart in the kitchen for them to track their savings. For children who are slightly older, think about incentivising them by offering to match their savings up to a certain point. This can be a great way to work towards a family holiday, for example, if finances are tight. Having an older teenager feel like they are contributing in a manageable way can be a source of pride for them – provided they don’t feel they are being "forced to pay for themselves"! 2. Spend what you can afford, not what you have. Whether your child gets money through gifts, birthdays, chores or pocket money, teach them to live within their means. Consider encouraging them to only look at their disposable income as 80% of what they possess. For example, if they are gifted €50 for a birthday, teach them to think of what they would spend €40 on. That way, there will always be a contingency of 20%, should their desired item fall on the higher end of the scale. This rather than their getting into the habit of borrowing the extra few euro from the Bank of Mum and Dad should they wish to buy something for say €60. Don’t get me wrong: there is no need for your children to feel or share your own financial strains and stresses. However, there is no harm in them becoming naturally aware of the price of things. If you take them on the weekly shop, get used to letting them know the cost of the items they’re begging you to buy; ask them to guess as you go along, or to hazard a guess at what the total bill will be at the till. You could also ask your child to add something to your shopping list (another invaluable personal financing tool!) once it’s gone. For older teenagers, there is no harm in them knowing what your rent or mortgage repayments are plus also what percentage of your net take home pay it represents. The parent’s hourly rate of pay is a sobering example of reality and the value of life’s needs and wants. After all, with any luck, they’ll be moving out themselves in a few years, and that dose of reality is necessary for the current housing market. We all use debit cards and many of us use credit cards, too. We also all know how easy it is to tap, tap, tap away hundreds of euro over the course of a week, without thinking about it. Get your children into the habit of seeing you pay for things with cash before it disappears altogether, or doing your accounts. They need to recognise the reality of money: a plastic card is not a magic money tree and our children need the opportunity not to inherit our less wise habits! There you go: four ways to make managing your finances a natural part of home life and an easy way for your kids to start learning lifelong lessons.